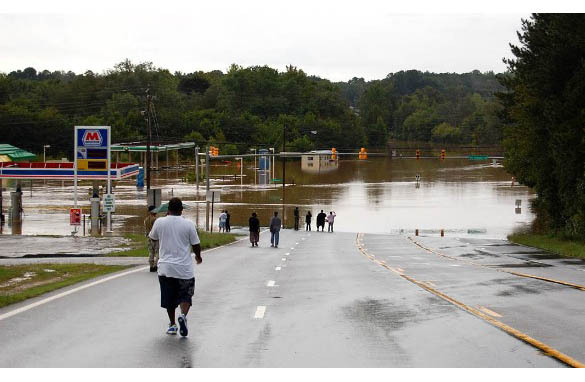 Some friends have sent their pictures of the flooding in and around Atlanta. We didn't get to use them on the air, so I thought I'd post them here as Kyra Blog Exclusives. CNNer Dave J has a 25-mile commute home. It took a good bit longer than usual to get there Monday afternoon. First of many roads I encountered like this on my way home. Commute time: 2 hrs. 50 min. 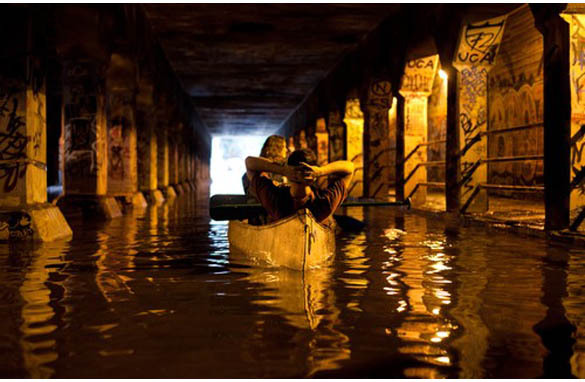 My "commute" is only 2 miles or so; even so, there were unexpected obstacles. Monday after work, I turned the corner and splashed into one. Lucky my car's got good clearance! Today, I heard an old co-worker's house was flooded – no details yet on how bad it is. Meantime, my friend Lily's been worrying about some of her pals too. 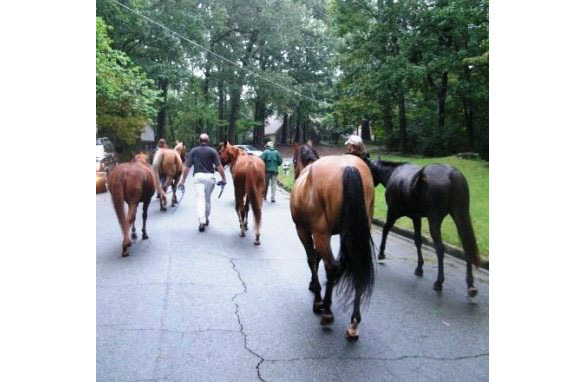 Recently in Atlanta, flooding has had massive effects on all types of residents, including horses. My name is Lily, I'm 11 years old, and I ride at Huntcliff Equestrian Center. Huntcliff received so much water it caused all horses to evacuate and move to Wills Park. 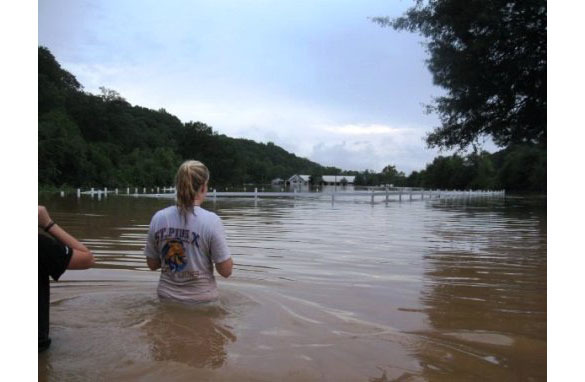 We don't know how long it will take to be able to go back to the barn, but at least all horses are safe. 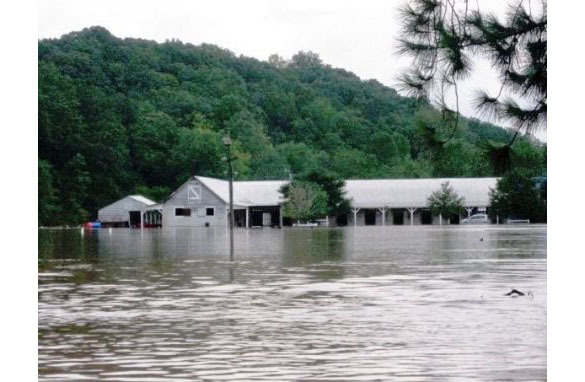 The barn is bordered by the Chattahoochee River, and the water rose up so high that it flooded the pastures and stables. The water has never been that high. It passed something called “the 100 year mark”. The ponies and horses had no place to go, and had to be evacuated by emergency workers. We don’t know how bad the damage is. I just hope we can get the horses back to their homes soon. New unemployment numbers are out today and behind those numbers are real people trying to find a job to support themselves and their families. Every Thursday on CNN NewsRoom with Kyra Phillips we're letting those people tell their stories and giving them a chance to connect with a potential employer. Today in our 2pm eastern hour you met David Daves, a laid-off sales manager who put his resume on a billboard in an effort to find a job. He's supporting his family which includes two autistic daughters. If you think you might have a job for him check out his website here. If you want to be part of the pitch get in touch with us here or on twitter @KyraCNN. The signs are all around us: rising levels of rudeness across the social spectrum. CNN's Don Lemon examines the causes that may be eroding civility, including the rise of social media that allow anyone to vent, spew hatred and even make threats with apparent impunity and anonymity. When heavyweight boxer John "The Quiet Man" Ruiz defeated defending champ Evander Holyfield in 2001, he became the first Hispanic to hold the WBA title. CNN's Don Lemon spoke with Ruiz about what it means to be a Latino pioneer. The drama at the U.N. General Assembly started during our show yesterday and continued well into the evening. In his speech, President Obama tried to distance himself from the policies of his predecessor, but also said that “those who used to chastise America for acting alone in the world cannot now stand by and wait for America to solve the world's problems alone.” Pres. Obama hasn’t had to share the media spotlight much since he was elected last January. That is until yesterday when two other men took their turn at the U.N. microphone. And Iranian President Mahmoud Ahmadinejad said he won “a large majority” in the June 12 elections and blamed capitalism for the world economic crisis. His comments about the Holocaust prompted some delegates to walk out of the room. There were dull moments in between, but overall, quite a day at the U.N.
We know you have lots to say about any or all of this. Go ahead and post your thoughts here.